Rokni et al. Nature Neurosci. 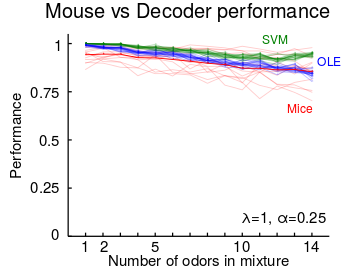 2014 study, in which mice were trained to detect target odors in mixtures of odors. The decoders are trained to predict the presence of target odors from activity patterns sampled from an estimated encoding model of mixtures based on 72 glomeruli and test performance is shown (for details see Mathis et al. Biorxiv 2016).